recognized through base-pairing between the anticodon of the initiator tRNA and the start codon (this is why it is critical that the initiator tRNA bind to the small subunit be/ore it binds to the mRNA). Correct base-pairing triggers the release of elF2 and elF3. Loss of elF3 (which had prevented binding of the large subunit) and elF2 (which was hound to the initiator tRNA) allows the large subunit to bind to the small subunit. As in the prokaryotic situation, binding of the large subunit leads to the release of the remaining initiation factors by stimulating GTP hydrolysis by the 1F2 analog, elFSB. As a result of these events, the Met-tRNA;Mcl is placed in the P site of the resulting BOS initiation complex. With the start codnn and Met-tRNA^6' placed in the P site, the eukaryotic rihosome is now poised to accept a charged tRNA into it5 A site and carry out the formation of the first peptide bond. 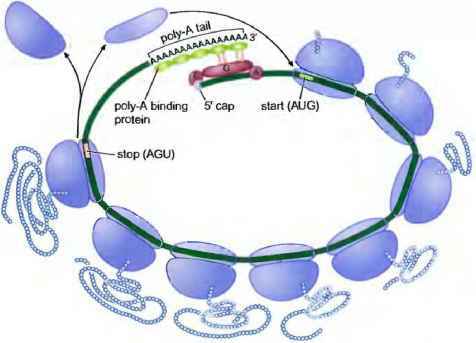 In addition binding to the 5' end of eukaryotic mRNAs, the initiation factors arc closely associated with the 3' end of the mRNA through its poly-A tail (Figure 14-29). This is mediated by an interaction between e!F4F and the poly-A binding protein that coats the poly-A tail. A consistent interaction between the two ends occurs because both elF'4F and the poly-A binding protein are bound to the mKNA through multiple rounds of translation. The interaction between these proteins results in the mRNA being held in a circular configuration via a protein bridge between the 5' and 3' ends of the molecule. It has long been known that the poly-A tail contributes to efficient translation of mRNA. The finding that translation initiation factors "circularize" mRNA in a poly-A-depundent manner provides a simple rationale for this observation: once a rihosome finishes translating an mRNA that is circularized via its poly-A tail; the newly released rihosome is ideally positioned to re-initiate translation on the same mRNA. figure 14-29 A model for the arcularization of eukaryotic mRNA. 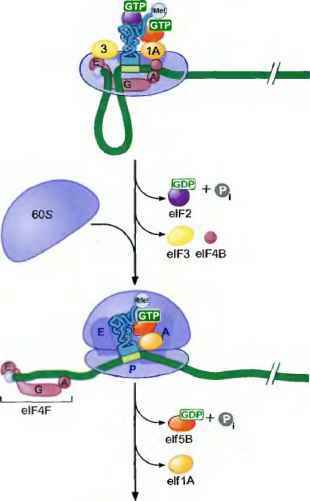 Grcu-larization is proposed tc be mediated by an interaction between the eiF4Cj subunit of elF4F and the poly-A bsnding protein. Not all eukaryotic polypeptides are encoded by an open-reading frame that starts with the AUG that is most proximal to the 5' terminus. In some cases, the first AUG is not in a proper sequence context resulting in its bypass, in other cases, short, upstream, open-reading frames (uORFs, encoding peptides less than ten amino acids long) are found upstream of the principal open-reading frame, that encodes a large polypeptide (Box 14-2 Figure la). In these cases, the uORFs act to regulate the extent of translation of a larger, downstream, open-reading frame. At least some of these uORFs are followed by RNA sequences thai cause a proportion (30—50%) of the small subunits that translate them to be retained on the mRNA after termination The retained small subunits continue scanning for the next AUG but can only locate it after a newly charged initiator tRNA is placed in the P site by elF2. As you will see in Chapter 16, this charac teristic can be exploited to regulate translation of downstream, open-reading frames. In other cases, these uORFs are simply bypassed at some frequency, allowing initiation at a downstream AUG—albeit at a greatly reduced rate. 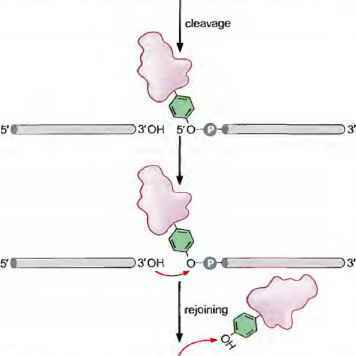 A more extreme example of initiating translation at sites downstream of the AUG that is closest to the 5' terminus is represented by internal ribosome entry sites (IRESs). IRESs are RNA sequences that function like the prokaryotic ribosome binding sites. I'hey recruit the small subunit to bind and initi ate at an internal site in the mRNA (Box 14-2 Figure lb), these are relatively rare in eukaryotic transcripts end are most often encoded in viral mRNAs that often lack a 5' cap end and have a need to exploit the sequences of their genome maximally. By using an IRES, a viral mRNA can encode more than one protein, reducing the need for extended transcriptional regulatory sequences for each protein-coding sequence. Different IRES sequences work by different mechanisms. At least one viral IRES directly binds to @|F4F, mimicking the normal recruitment of this complex through interactions with the 5' cap Others are thought to interact directly with the small subunit rRNA in a manner analogous to the prokaryotic ribosome binding site. Why do translation initiation factors hold eukaryotic mrnas in a circle?